The murders drew national attention, prompting television news broadcasts to run advertisements asking viewers, "It's 10 p.m. Do you know where your children are?" 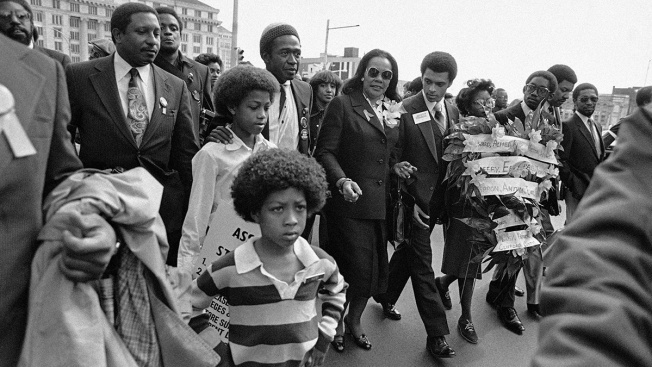 Coretta Scott King, wearing glasses, leads a march through downtown Atlanta accompanied by entertainer Ben Vereen, upper left, on March 15, 1981. The march was organized in memory of the 22 missing and murdered children of Atlanta. Bottoms announced Thursday that investigators will be re-evaluating evidence in a series of murders of black children and young black adults in Atlanta between 1979 and 1981, NBC News reported. Bottoms added that looking back at the evidence is part of her effort to make sure the victims' memories are not forgotten, and “to make sure, in the truest sense of the word, to let the world know that black lives do matter."